A brochure describing Westinghouse Electric Corporation's Quality Improvement Program for its Power Generation Business Unit (PGBU), launched in 1990 with the goal of creating a Total Quality Culture throughout the organization and all phases of the operation. Total Quality was defined as "Performance Leadership in meeting customer requirements by doing the right things right the first time" and the program was based on four imperatives: customer orientation, human resource excellence, product and process leadership, and management leadership. Originally called the Westinghouse Electric Company, George Westinghouse (1846-1914) founded his manufacturing company in Pittsburgh, Pennsylvania, on January 8, 1886. In 1889, he renamed his business The Westinghouse Electric and Manufacturing Company. Westinghouse's primary products include turbines, generators, motors and switchgear related to the generation, transmission, and use of electricity. The company changed its name to Westinghouse Electric Corporation in 1945. In 1981, the company began to relocate its division headquarters for the Steam-Turbine Generator Divisions from Pennsylvania (turbines from Lester and generators from Pittsburgh) to Orlando, Florida. The PGBU building was located in The Quadrangle, at 4400 Alafaya Trail. Originally, Westinghouse had purchased a large plot of land for future development that extended westward from Alafaya Trail to Rouse Road. The original headquarters was located on several acres of that land parcel close to Alafaya Trail. In 1994, after a major corporate management shuffling, and a top-level decision to change from an industrial manufacturing company to primarily a broadcasting/communications company, Westinghouse bought the CBS Network and changed its name to the CBS Corporation. As the PGBU grew in size, other buildings in the area were leased and then, after PGBU was sold to Siemens Corporation of Germany in 1998, additional buildings (Quad II and Quad III) were added to the original complex at the Quadrangle. From 1998 to 2003 the Orlando operation was known as Siemens-Westinghouse, after which the name of Westinghouse was dropped. The operation has been known as Siemens from that time forward. Original 37-page brochure, 1990: Private Collection of Harry L. Jaeger. Digital reproduction of original 37-page brochure, 1990. Originally published by Westinghouse Electric Corporation. 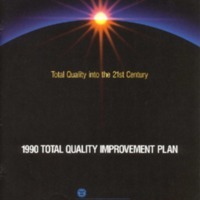 “Total Quality into the 21st Century: 1990 Total Quality Improvement Plan.” RICHES of Central Florida accessed April 21, 2019, https://richesmi.cah.ucf.edu/omeka/items/show/7456.